Nurul Bahiyah Ahmad Khairudin, Habibah A Wahab. “A New Approach in Protein folding studies revealed the potential site for nucleation center”. WASET 76. 2011. Page 445-450. Nurul Bahiyah Ahmad Khairudin, Habibah A Wahab. “Protein Structure Prediction Using Gas Phase Molecular Dynamics Simulation: Eotaxin-3 Cytokine As A Case Study”. ICMCB 2011. Melaka. 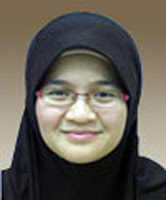 Nurul Bahiyah Ahmad Khairudin, Habibah A Wahab. “The Investigation of the nucleation center for protein folding using combined knowledge based and molecular dynamics simulation”. ICBIOE’11. Kuala Lumpur. Nurul Bahiyah Ahmad Khairudin, Habibah A Wahab, Mohd Razip Samian, Nazalan Najimudin (2008). “An Approach Towards the Prediction of Protein Tertiary Structures: Molecular Modeling Perspectives”. In: Ida Idayu Muhamad, Chew-Tin Lee (eds). Special Topics in Bioprocess Engineering, Vol 3. Johor: Universiti Teknologi Malaysia Press. 1-34. NB Ahmad Khairudin, HA Wahab, MR Samian, N Najimudin (2008). “The effects of gas phase on the protein conformation: A molecular dynamics study on eotaxin-3 cytokine”. JNCRE Modelling Innovation, FKKKSA, Special Edition:18-28. NB Ahmad Khairudin, HA Wahab, MR Samian, N Najimudin (2008). “Structure prediction on large protein using the combination of knowledge-based and physics-based approaches: Method validation on cholesterol esterase”. JNCRE Modelling Innovation, FKKKSA, Special Edition: 141-154.